This is what I got? I shared with you all, my visit to the Garden of Five Senses for the Garden Tourism Festival, way back in February. Being surrounded by hundreds of varieties and colours of blooming plants at the peak of their season left me craving to bring some of these beauties at home. I was especially mesmerised by the Dahlias, which, due to their sheer numbers and colours attracted everyone. The many colours of Gerberas had me wanting to take them home, but of the many plants that attracted my attention, there were white tulips, one of the exhibitors had there for display, that I instantaneously developed a crave for. Since this was my first visit to the Garden Tourism Festival, I had no idea how to procure the plants, and whether we were allowed to but the plants that were on display, as it was the last day of the exhibition. I asked for how and where to buy the plants and was directed towards the stalls. Once there, I was awed at the sheer numbers of plant lovers I saw there. Frankly speaking, till that day, I was under the impression that there were just a handful of people who liked gardening, more so, because here in Delhi, we are too much constrained by our living space, that there is quite less room for activities like gardening. But, that view changed my perception. I made my way through the dense crowd of people looking for plants, seeds, planters, cactuses, tubers and corms. Though, I absolutely dread the idea of going inside such a swarm of people, I had to pass through it, to go right in the middle of the crowd to find plants, that I wanted to buy. All the while, my eyes searched for Lilies, Gerberas and Tulips. Though, I absolutely love Roses, which have a special place in my heart, I have plenty of them growing on my rooftop and the idea of adding one more to the collection and then getting to hear from my mum about getting roses only kept me away from them. 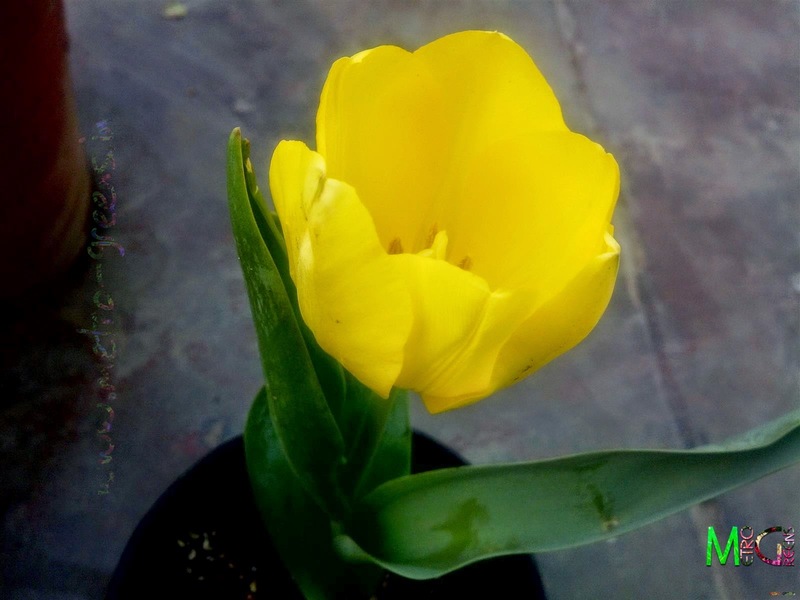 I scanned through the stalls, and there it was, in a stall on one of the corners, two pots of yellow Tulips, one of them waiting for me to take it home with me. I paid for it, had no choice but to buy only one as both were of the same colour. Then I settled down for some tubers of Glorissa and bulbs of Barbados Lily, a variety of Amaryllis Lily. The Tulip, came home and bloomed in a couple of days. I wanted to share the one and only bloom that small tulip plant got. Yellow Tulip plant with the bud. 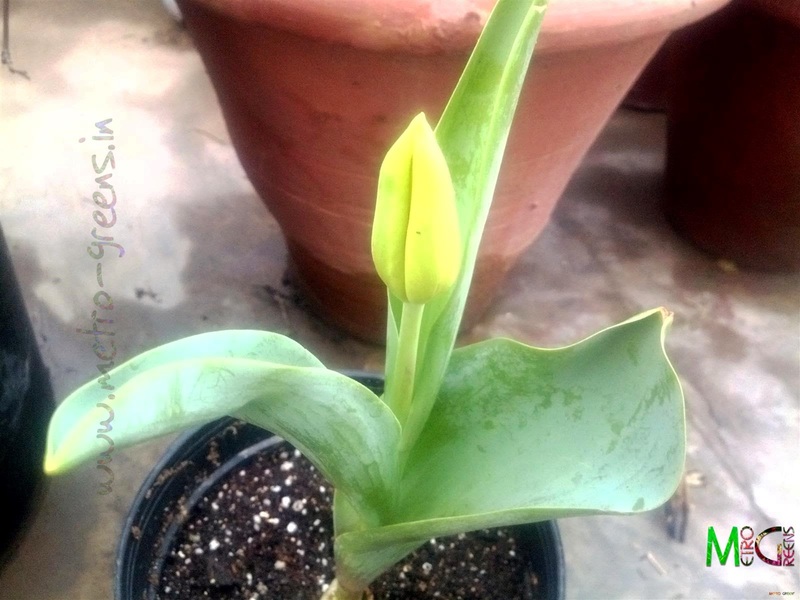 Yellow Tulip plant with the bud about to bloom. 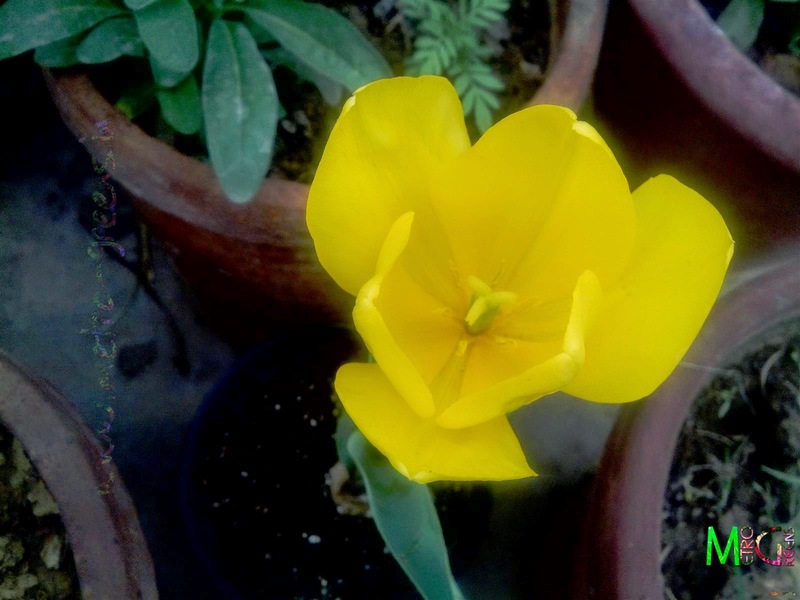 Yellow Tulip plant with the bud blooming. 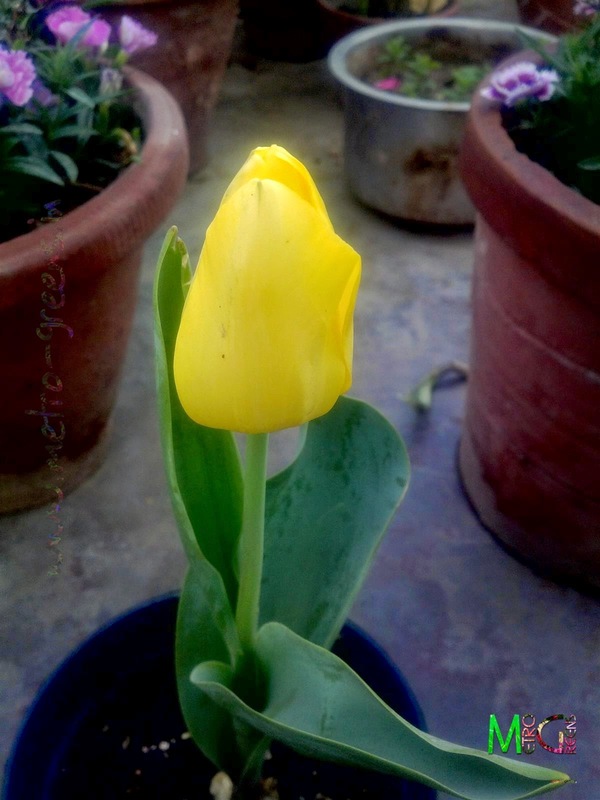 It was an amazing sight to see a tulip blooming in my terrace garden. It lasted for around a week before dying away. 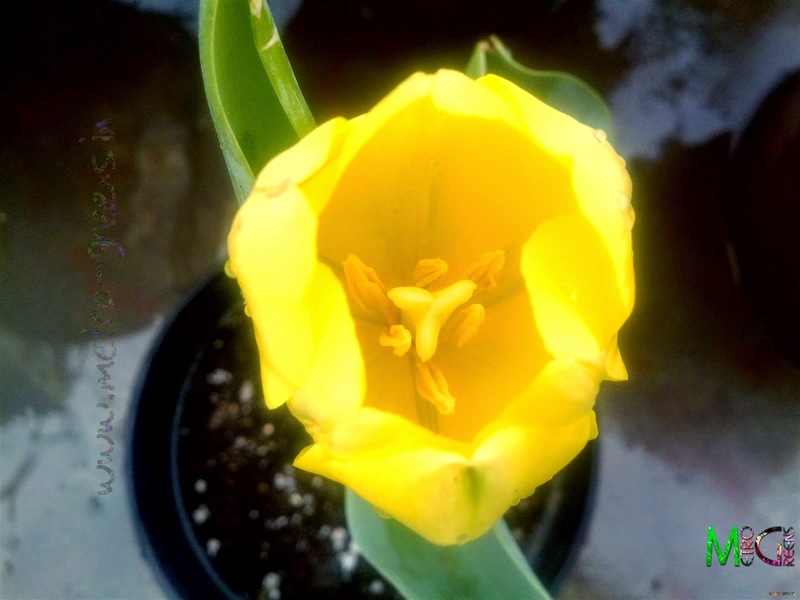 As the bloom withered away, it left me with a dying plant, and when I saw a couple of new shoots from the bottom, I was filled with joy again, expecting a lot many tulip plants blooming in the next winter. However, appears like Tulips can't even stand even a bit of more temperature. The new shoots died away. I had to remove the only corm that was there in the pot, only to find that it started dying outside too, so, have put it back again in the pot hoping it would just survive to give me a plant next year. Anyways, I had a lot going on in my terrace garden, and I know I've been a bit late in letting you all know about all of that. I will hopefully be more regular in posting here, and will try covering all of it that happened in the garden, in the upcoming posts. So, stay tuned, and HAPPY GARDENING!